This degree program is intended for individuals who wish to pursue a career in science or a related field. Such fields include, but are not limited to, astronomy, biochemistry, biology, biophysics, biotechnology, chemistry, environmental geology, environmental science, forensics, forestry, geochemistry, geology, geophysics, home economics, marine biology, meteorology, mortuary science, nutrition (or dietetics), oceanography, optometry, pharmacy, physical education, physics or plant science. This program also is intended for those who wish to pursue medical, dental or veterinary degrees. Note: A minimum of a bachelor’s degree is usually required of individuals planning to work in science or a related area. Therefore, students should take the CCRI Associate in Science degree program with the expectation of transferring to a four-year college or university. The choice of which elective credits to select should be made in consultation with an advisor from one of the science departments in accordance with the transfer requirements of the four-year school. Many courses require prerequisites, corequisites and/or testing. See course descriptions for details. Students should consult the transfer requirements of their intended school of transfer. To be admitted to this program, applicants must have a minimum level of math preparation in order to take and successfully complete MATH 1200 (College Algebra) in the first semester. OR Social Science Elective See this page for a complete list of courses that fulfill the HUMN attribute. See this page for a complete list of courses that fulfill the MSCI attribute. Select two pairs of sequential courses from the following for a total of 16 to 18 credits. Select two pairs of sequential courses from the top three in the list above (BIOL, CHEM or PHYS) for a total of 16 to 18 credits. If you select CHEM 1030, contact the Chemistry Department for information regarding a placement exam (to be taken prior to enrolling). Biotechnology credits can be used toward the completion of the Science track leading to an Associate in Science (A.S.) degree. The four-credit Cell Biology for Technology (BIOL 1000) is one of the suggested science courses. 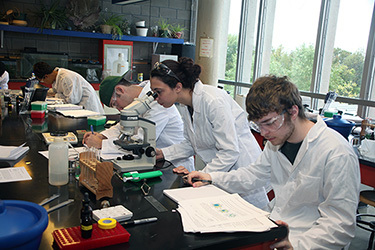 Eight of the Biotechnology certificate program credits (BIOL 1300, 1310 and 2480) would count as science credits and the remaining six credits could be used as elective credits. See the Biotechnology certificate program for more information.